The tropical rain forest landscape has been transformed to a mosaic composed of patches of crops, secondary vegetation and remnant forest fragments of different shapes and sizes. Isolation of patches and fragments is a critical issue in the maintenance of local species diversity. In this study we focus on the dispersal of propagules by birds to understant the movement of plants between landscape components. Seed deposition and the behavior of frugivorous birds were monitored at four isolated fig trees (Ficus yoponensis and F. aurea) in man-made pastures. Seed deposition was measured by trapping seeds under canopy trees for six months and by direct observation of bird visits to the four trees for one year. Seed deposition densities were 465, 614, 632 and 1097 seeds/m2 accumulated over six months under each of the four trees. We recorded 8268 seeds of 107 species under the trees, among them, 6726 seeds (81%) were of 56 species dispersed by vertebrate frugivores. Seeds of tree species accounted for 26% of the total species. Seventy-three species of birds perched in the observed trees, and 3344 visits were made by 47 species of frugivores. Frugivorous birds occurred in two groups: resident species nesting in the pastures and resident species nesting elsewhere. Propagule exchange between landscape components is clearly influenced by the behavior of these two groups. Structure and dynamics of the landscape depend on plant species availability within the mosaic. 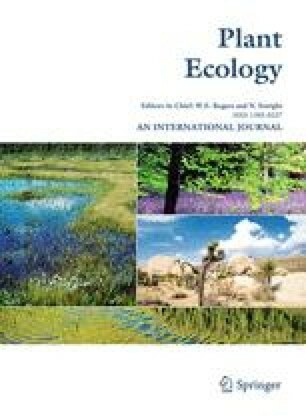 This availability is high and suggests possibilities for the management of the local species diversity of tropical rain forests.